Ash Wednesday and Lent in 60 Seconds - with Lego! Click the image at the left. These 40 suggestions are great for children and families. 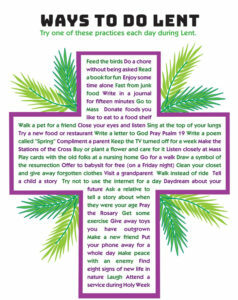 Try one pf these practices each day during Lent. Teens created the cross of Lenten practices shown to the right. 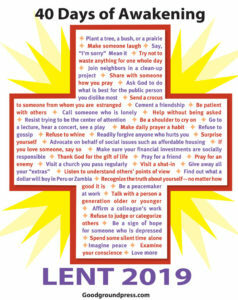 Good Ground Press invites you to download this FREE Lenten resource to print. 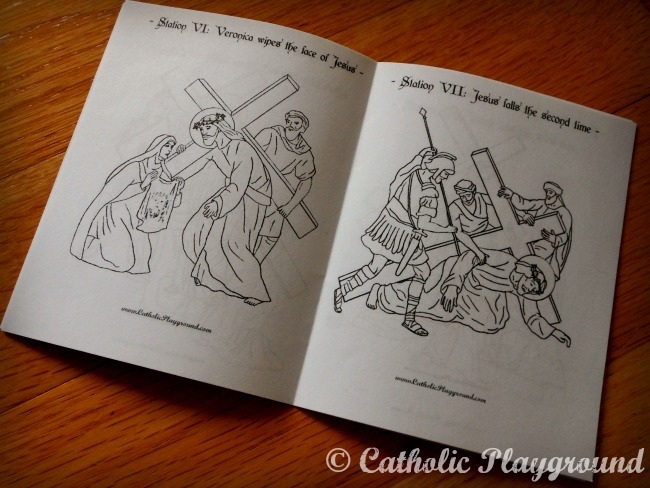 Here is a free printable stations booklet from Catholic Playground. 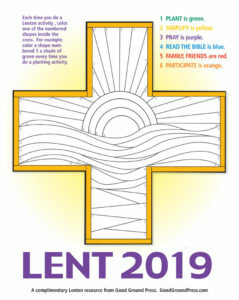 ​This illustrated book is full of wonderful family activities to help parents and children alike better understand and celebrate the seasons of Lent and Easter. This large size volume is the perfect book to help families learn together and share the joys of this important time in the liturgical year. Filled with a variety of family activities, saints' celebrations and crafts, this book has something for everyone in the family. 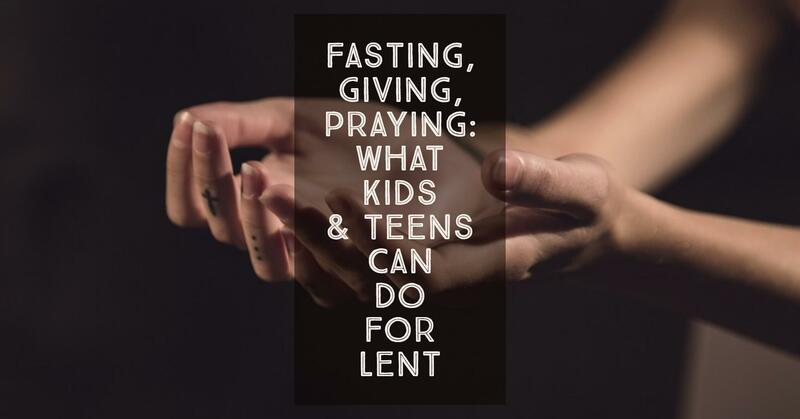 Family activities include the making of a Paschal candle, a family-friendly Stations of the Cross, a Family Altar, a Garden for Mary, a Messianic Seder meal, recipes for home-made bread and more. Also included are stories of special saints for the season with activities and prayers. Finally, it offers numerous craft activities including cross stitching the Guardian Angel prayer, making alms boxes, Easter eggs, popsicle stick shrines and holy water sprinklers. Following in the footsteps of his widely popular Advent series--Jotham’s Journey, Bartholomew’s Passage, and Tabitha’s Travels--well-known author Arnold Ytreeide presents a captivating story to take families through the season of Lent, culminating on Easter Sunday. Thirteen-year-old Amon, the son of Jotham and Tabitha, enjoys playing with his friends but is also ready to join his father in the temple court where only men are allowed. Eager to be considered a man, Amon struggles to divide his time between his friends and his duties to family and faith. But when Jotham is falsely accused of a terrible crime, Amon willingly sacrifices his childhood ways in order to save his father’s life. Along the way, he sees the jubilant crowds that gathered on Palm Sunday, outwits the Roman soldiers that planned to kill both his father and Jesus, hears the Messiah address the angry crowds, is present during the daring betrayal of Judas Iscariot, and witnesses the ultimate sacrifice made on Good Friday. With short, exciting chapters, reflections for family devotions, and advice for making Lent a meaningful experience, Amon’s Adventure will help families discover anew the spiritual power of the resurrection story. Featuring the wonderful illustrations of Tim Jonke, this best-selling children’s book tells the Easter story from a new and unusual point of view. Children will be deeply touched as they understand, perhaps for the first time, the significance of Christ’s life and his atoning sacrifice on the cross. A Continual Feast is a cookbook full of wonderful recipes and ideas drawn from throughout the Christian tradition, with suggestions about when, and why, these dishes might be served. It contains more than 275 recipes with which to celebrate all the holidays throughout the Christian year, as well as the many shared rituals that strengthen family bonds and enrich the significance of the day to day events of our lives. How these rituals, rites and feasts came about, how they are celebrated around the world, and how you can bring them into your home are described every step of the way. Includes wonderful illustrations.